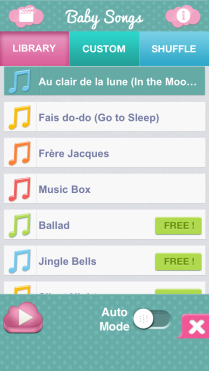 Baby Songs is a free app which lets you play lullabies and soothing melodies in french, japanese and english. 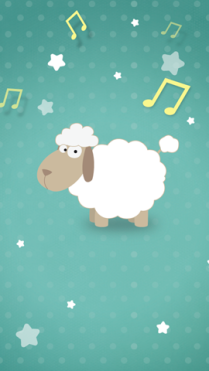 A free app which lets you play lullabies and soothing melodies to your little ones, helping them fall sound asleep. Designed for babies & loved by parents all over the world. In the latest app update we have added new lullabies in english and japanese. On top of that, the iPhone and Android version come with new singing night lights. The cute little animal night light sing the selected lullabies! 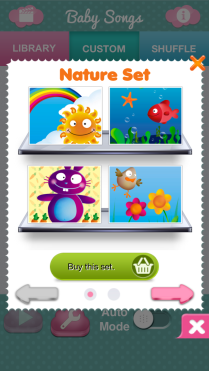 Join the Baby Club in our iPhone apps to enjoy gifts and many other features! 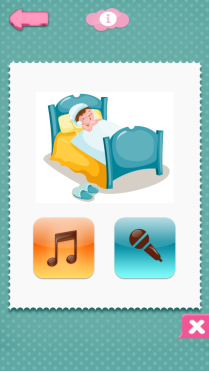 Baby Songs helps your baby fall asleep and to spend peaceful nights. When your baby cries or fusses, the application automatically detects the ambient sounds and immediately starts playing lullabies and relaxing songs. The sound gradually diminishes until baby is asleep. It’s your ultimate baby bedtime companion! 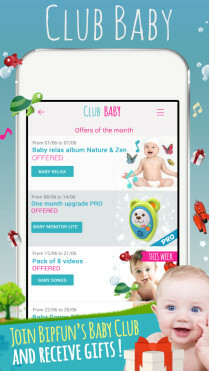 Let your baby enjoy a full night’s sleep with this magical app that will automatically play soothing lullabies & melodies as soon as it detects ambient sounds and slowly fade out until your baby falls sound asleep.